Active engagement by our members propels the Chamber and helps us accomplish our mission and vision. During 2017, about 60 different Chamber-sponsored clubs, councils and task forces collectively engaged over 1,000 people. The REACH program ensures our certified small and emerging businesses (SEBs) are ready to bid and capitalize on new projects, as well as reach their strategic goals – and volunteers like Curtis Johnson and Bob Carlisle play an important role in this mission. Education is at REACH’s core. Since our launch three years ago, REACH volunteers – architects, attorneys, bankers, code writers, credit remediators, engineers, general contractors, and more – have helped us provide over 7,000 hours of 1-on-1 and group education and mentorship. “It would have been an impossible challenge without the incredible generosity of Chamber members. They understand economic growth is not a zero-sum game and that by helping others, they are laying the foundation for their own further success,” said Winsley Durand III, REACH’s Executive Director. 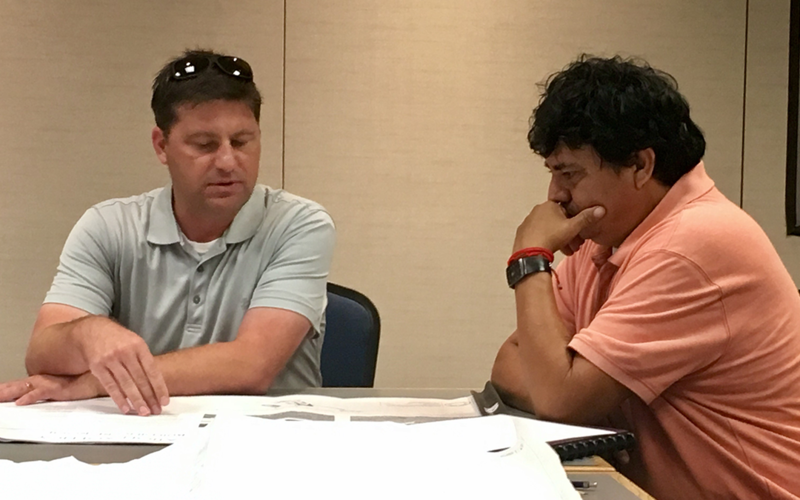 Curtis Johnson, architect and Principal with DLR Group, has been a steady presence in the Plan Room, a no-charge offering that gives small and emerging construction businesses the tools and expert insight they need to bid and capitalize on new projects. Johnson says he has helped contractors understand everything from the scope of work presented in an RFP to the bidding requirements themselves. Volunteer also are needed for REACH Beyond, a 12-month mentoring program that pairs mentors from general contracting firms with mentees from small and emerging construction companies. REACH Beyond graduated its first class of mentees in May. Bob Carlisle, founder and president of MCL Construction, made a tremendous impact on protégé Cameron Gales, managing owner of Gala Painting. For more information about REACH, REACH Beyond, or volunteering, please contact our REACH team at ernpu@bznunpunzore.bet.